Beginning with eery sounds that would be noxious fumes if you could smell them, the listener is soon pulverised by the racing beats of Morgan Ågren (Mats/Morgan, Zappa’s Universe). Box is a quartet comprising Ågren plus guitarist Raoul Björkenheim, Trevor Dunn on bass and Ståle Storløkken on keybaords. Together they surge forward like a barely controlled race horse – step in front of this lot and you’ll be flattened outright. At about the five minute mark, the quartet start to get really hectic, creating a roiling musical melange that the next minute they unexpectedly defuse, returning to spare, haunted ambience. Björkenheim first recorded with the late, great Finnish drummer Edward Vesala before leading the unjustly overlooked Krakatau. After that group broke up, he made two albums with Paul Schütze’s post-Miles Davis supergroup Phantom City and followed up with three Scorch Trio albums, recorded with the brilliant Norwegian rhythm section of Ingebrikt Håker Flaten and Paal Nilssen-Love. Ståle Storløkken is probably best known as keyboard player with power improv giants Supersilent. Trevor Dunn plays bass for the likes of noise/terror artists John Zorn, Fantomas and Mr Bungle. With the sort of pedigree described above, Studio 1 was never going to be a gingham-decked picnic. More appropriately, the group might be characterised as the vicious thunderstorm and crazed bulls likely to destroy such a peaceful event. 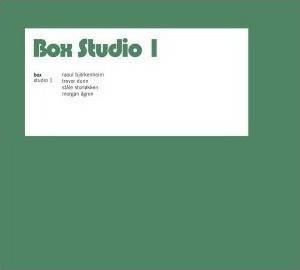 Studio 1 was the result of a commission to accompany an art/film project called Box by writer/director Philip Mullarkey. There was no preparation, planning or pre-composition. Opening track, Untitled 9 is the album’s longest at seventeen minutes twenty seconds – it’s as if the group were trying to test the unwary listener’s endurance. The remaining five tracks range between three and eight minutes in length. This is thrilling music that is by turns frantic, incessant, nervously becalmed, morbid, threatening and noisome. Each moment is information-rich with detail and tense interplay. It sounds like it was recorded by aliens in the same way that Miles Davis’ On The Corner, Jon Hassell’s City: Works Of Fiction or Sinistri’s deconstructed improv-blues does. Although in many senses at opposite ends of the spectrum, there’s also an inherent density that chimes with the more challenging ends of minimal techno. Studio 1 throws down a gauntlet – the rewards for picking it up are manifold. More please. I haven’t been paying as much attention to Rune Grammofon of late. Sounds like it is about time I got involved again, with this and the new Scorch Trio due out as well.